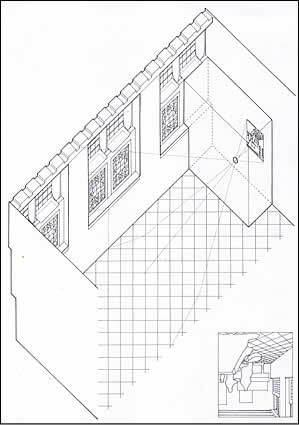 Figure 2: A simple booth-type camera obscura at the back of Vermeer's room. The optical image is projected onto the back wall. Viewed from inside the booth, the image is upside down and mirror-reversed - as shown in the version of 'The Music Lesson' at lower left. Figure 3: A simple booth-type camera obscura, as in Figure 2, with the difference that here the optical image is projected onto a translucent screen set in an opening in the back wall. This image, viewed now from an adjacent space outside the room, is still upside down, but it is not mirror-reversed - as shown in the version of 'The Music Lesson' at lower right. Using a camera with a translucent screen, as in Figure 3, Vermeer would have had to trace the image onto some semi-transparent medium, such as thin paper, and then transfer it to the canvas. In a camera with the solid wall as a screen, as in Figure 2, he could - in principle - have hung his canvas on the wall and projected the image directly onto it; but that image would have been mirror-reversed. I propose in the book that it is just possible to see Vermeer's cubicle, if very indistinctly, in the panorama of the back of the room reflected in the mirrored ball in 'Allegory of the Faith'. 11 David Bomford has questioned whether this small black rectangle is tall enough for a booth accommodating the painter. Maybe, he says, it is some lower piece of furniture, such as a table or chest. 12 I would not want to claim that the height is easy to measure with any precision in such a tiny detail. But the top of the booth does seem to be only just a little below the tops of the window casements, in which case it would indeed be sufficiently tall to stand in. It should be remembered what is more that Vermeer always sat to paint, as shown by the heights of the paintings' viewpoints. 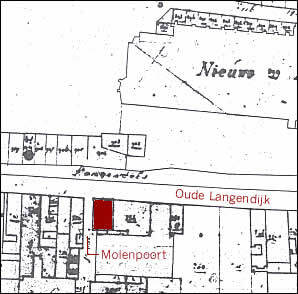 Figure 4: Enlarged detail from an 1830 map of Delft, showing the location of Maria Thins's house (shaded) as identified by Montias. The house fronts on to the Oude Langendijk. The Molenpoort, a narrow alley, runs along the side of the house. 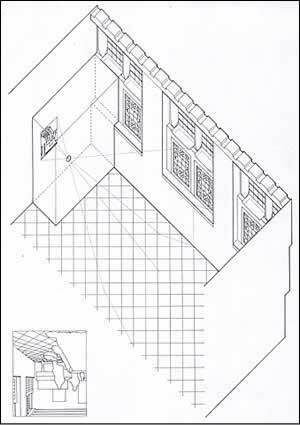 Figure 5: Vermeer's room, mirrored in its entirety in relation to what we see in the paintings. The geometry of the room itself remains unchanged (since it is symmetrical): the effect is of seeing the same room from the other end. The optical image projected on to the back wall, as seen from inside the booth-type camera, is still upside down, but it is not mirror-reversed - as shown in the version of 'The Music Lesson' at lower right. In this situation, Vermeer could have projected an image of the scene directly onto his canvas and traced it. There is one further theoretical possibility for the relationship of camera image to room, which I rejected in the book but which James Elkins has urged me to reconsider.18 This is that Vermeer's entire room was not oriented as we see it in the paintings, but was mirrored in relation to the paintings, like the room Alice stepped into through the looking glass (Figure 5). 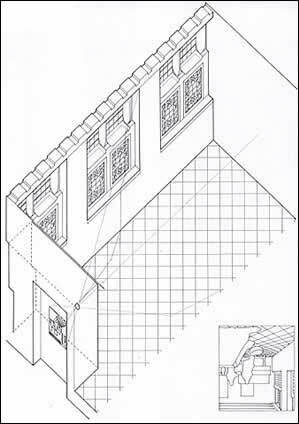 Because of the symmetrical design and arrangement of windows and floor tiles, this looking-glass room would have been exactly the same in its geometry as the room we see in Vermeer's paintings - as Figure 5 illustrates - but viewed from the other end, with the windows to the painter's and the viewers' right.19 I had two reasons for abandoning, with some regret, this initially attractive idea. The first was that Vermeer's models hold wineglasses, pour from jugs and play musical instruments always with their right hands. The second and more important reason was that there are real objects depicted by Vermeer which are asymmetrical, notably the maps and paintings by other artists, but which are obviously not reversed in Vermeer's painted versions. Elkins makes the suggestion that the models could easily have been asked to hold objects in their left hands. He points out furthermore that the great majority of the asymmetrical items are seen frontally, not at oblique angles. This is true of all the 'painted paintings', the great majority of the maps, and the decorated case and lid of the virginals in 'The Music Lesson'.20 We assume a camera with the solid back wall used as a projection screen, as in Figure 2. The projected image is therefore mirrored; but because the room itself is also mirrored, the end-result is an image whose orientation matches Vermeer's final painting (see Figure 5). Elkins agrees that Vermeer could have worked as follows. First he would have traced the complete scene, leaving blank outlines in place of the images of the maps or 'painted paintings'. He would then have made a separate tracing on paper of the image of each map or painting, reversed this tracing, and reintroduced it in the appropriate position in the image of the whole scene. Because all of these items are seen frontally, and their images are therefore simple rectangles, this would have been a perfectly feasible and straightforward procedure. It has the great merit that the image in the camera can now be projected onto the canvas, and the greater part of it can be traced directly onto the canvas (with the exception of the asymmetrical objects) without any need for intermediate drawings.